Though the sci-fi comedy Paul just hit theaters featuring Simon Pegg and Nick Frost, another comedy with an alien focus featuring one-half of the British duo has been gaining some buzz since it's premiere at the South by Southwest film festival last week (see all of our coverage here). Director Joe Cornish's Attack the Block featuring Nick Frost in the story of a group of British hoodies fighting off an alien invasion on their block has had plenty of praise across the board. Jeremy had some good things to say about it (see the trailer here), and now SlashFilm has revealed a great quad poster for the film which you can see below. Follows a gang in South London defending their block from an alien invasion. "Think Assault on Precinct 13 only with monsters and a tower block. Or La Haine crossed with Aliens. It's inner city vs. outer space." 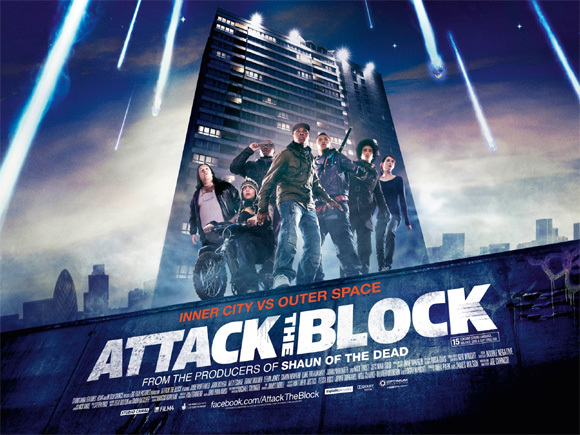 Attack the Block is both written & directed by up-and-coming British filmmaker Joe Cornish, of "The Adam and Joe Show" back in the 90's and other bits of work since then, like co-writing Edgar Wright's Ant-Man script. Attack the Block is set to hit theaters only in the UK in May, but it doesn't have a US distributor yet, so we're not sure when to expect it. In the meantime, you can check out their official webpage or Facebook! I know nothing about this movie, but that poster has a DEFINITE "left 4 dead" vibe.